The U.S. 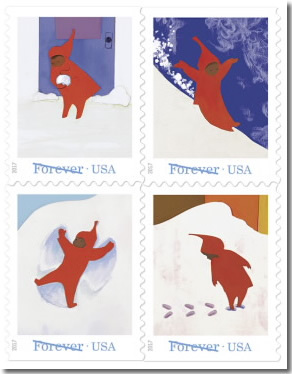 Postal Service® celebrates Ezra Jack Keats' story, The Snowy Day, with a Forever® stamp you could use to mail cards this holiday season; you can order booklets of 20 stamps from the USPS. Written and illustrated by the celebrated children’s author, The Snowy Day was one of the first prominent 20th-century picture books centered on an African-American child. Peter leaving footprints in the snow. Since The Snowy Day was published in 1962, young readers have enjoyed joining Peter on his winter adventure. In 1963, Keats was awarded the prestigious Caldecott Medal, given annually to the artist of the previous year’s best children’s picture book. The Snowy Day has become a classic; since its release, it has sold millions of copies. The Snowy Day stamp is issued as a First-Class Mail® Forever® booklet of 20 stamps. These Forever® stamps will always be equal in value to the current First-Class Mail one-ounce price; Forever® stamps can be used to send one ounce of First-Class Mail even when stamp prices increase in the future.